Our roofing experts are certified for all roofing types and maintenance inspections. Tile roof are generally the low in maintenance and rarely require inspections. Metal roofs are the lowest in maintenance and insurance cost. Foam roofs if coating is maintained properly can be a low cost system. Roof coating can greatly reduce energy and maintienance cost of almost all roof types. 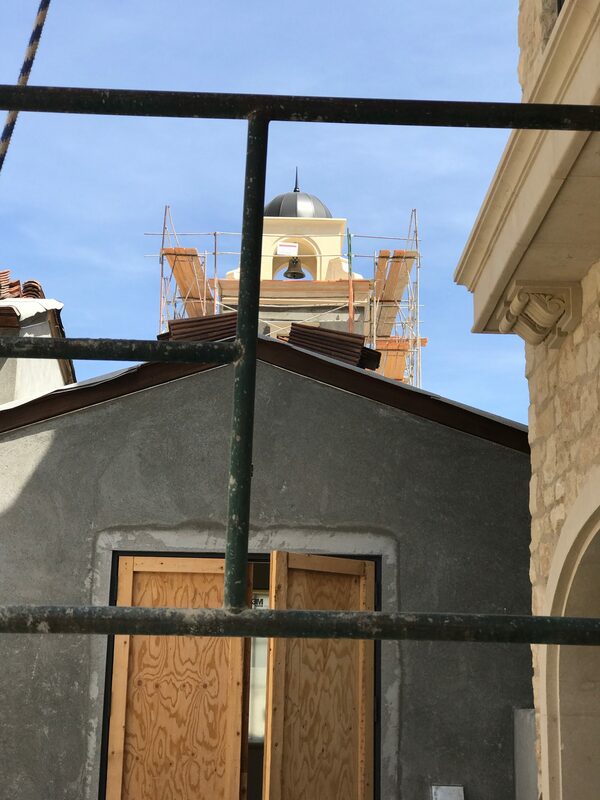 Zinc and Copper domes top of every roof type. Espeicailly with a matching Finial. A flat roof is the generic term for roofing materials installed on low-slope surfaces. Traditionally, Foam, Built Up, Rolled or roof coatings are usually installed. They are slowly being replaced by modern flat roofs such as Polyurethane Foam, Modified Bitumen and Single Ply with roof coatings. Generally Carefree, Cave Creek, Fountain Hills, Paradise Valley, Phoenix and Scottsdale roofing codes for residential flat roof pitch of a 1/4inch per foot or more. Commercial flat roofs statewide are typically 1/8inch per foot. The life expectancy of a flat roof is highly dependent to the roof maintenance done with a maintenance plane or yearly inspections. 10 years is an average life cycle without a maintenance plan and 30+- with roof coating maintenance plan. Maintenance can include repairing flat roof leaks and correcting issues such as alligatoring, cracking and ponding water as quickly as possible. Roof Coating – Your Environmentally Friendly, Energy Saving Answer to a Leaking Flat Roofs on commercial and residential properties. Flat roof coating give the building owners a number of benefits including waterproofing the substrate, helping to prevent leaks, and creating more energy efficient interior climate control. A roof coating can be used for flat roof maintenance and flat roof repair. When used for building maintenance, coatings can qualify for a 100% tax deduction the first year! All flat roof types for roof coating. Annual roof maintenance plans involves inspecting and repairing penetrations like vents, pipes or ductwork. These penetrations can open up and may need to be re-sealed periodically. Additionally, repairs seams and flashings should be made. Blisters or de-laminations should be cut off and repaired immediately since they will leak over time. Infrared thermography is usually performed on flat roofs to determine the presence of moisture before any repairs are made. The pictures are taken shortly after sunset. When the roof is cooling, wet spots under the roof, continue to emit heat. Flat roof repair and restoration; usually involves pressure washing and the application of a roof coating. Coatings have become a very popular option for repairing Scottsdale roofs. Elastomeric coatings drastically reduce the heat build up on Arizona flat roofs and extend the service life by 10 or more years. Concrete roof tiles we use are made of portland cement, sand and water in varying proportions. The material is mixed and extruded on molds under high pressure. Slurry Finish – The exposed surface of a tile may be finished with cementitious material colored with synthetic oxide additives. Color Thru – The Portland cement mixture is tinted leaving a surface color that carries thruout the tile. The roof tiles are cured to reach the required strength. They generally have lugs on their undersides for anchoring to batten strips. There are additional water locks or interlocking ribs on the longitudinal edges that impede movement and prevent water infiltration. Clay roof tiles, there are a wide variety of profiles, styles, finishes and colors available. Color may be added to the surface of a tile or dispersed throughout (color through). Special southwest texture may be added in surface treatment. In addition, each tile type may have separate field, ridge, hip, gable and terminal tiles that are various shapes. Recommends tile systems be applied over continuous T&G plywood decking. We recommend the use of a minimum 5/8 thick nominal exterior-grade plywood. Oriented strand board (OSB): Be concerned with potential H-clip fastener-holding problems and dimensional stability because of the effects of moisture where OSB and other non-veneer products are used as decking. Preservative-treated wood: Many tile material manufacturers recommend wood decks be constructed with wood that has been treated with a non-oil preservative pressure treatment or with non-treated air- or kiln-dried lumber. Fire-retardant-treated wood: Because of the deterioration of some fire-retardant-treated wood panels caused by chemical reaction, special care should be given to investigate the use of fire-retardant-treated wood panel decks. For some types of roof tiles, batten and counter-batten systems are used to hang roof tiles that has head lugs. Battens are spaced according to the length and exposure of the specified roof tile. Battens should be fastened to the deck with 8d common, galvanized, corrosion-resistant nails at approximately 12 inches on center. Clay roof tiles are produced by baking molded clay. The density of the clay is determined by the length of time and temperature at which it is heated. Tiles may be glazed and also may have surface texture treatments applied. As a result, there are a wide variety of roof tiles profiles, styles, finishes and colors available. In addition, each roof tile may have separate field, ridge, hip, gable and terminal roof tiles of various shapes. Installation methods depend on the nature of the roof tile being installed; that is, whether it is two piece, one piece, interlocking or flat roof tile. Tile underlayment (or “felt paper” as it is frequently called) is installed over the deck before the application of roof tile. Tile underlayment performs two primary functions: it provides temporary weather protection until the roofing tile is installed, and it provides a secondary weatherproofing barrier if moisture infiltrates the roof tile covering. Many roofing tiles have outlived the underlayment felts over which they were installed. Therefore, the roof tile underlayment’s service life-cycle should be comparable to the design service life of the roofing tile covering. Asphalt saturated, non-perforated organic tile felts are among the most common tile underlayments; they commonly are designated as Type 15 and Type 30 or referred to as No. 15 and No. 30, which are reflective of a once used pound per square weight designation. The terms Type I and Type II now are used within the industry in lieu of No. 15 or No. 30, respectively. As a Phoenix roofing contractor we do not recommend the use of type 1 or 2. Another type of roofing tile underlayment is a synthetic roof tile underlayment. It is characterized as being lightweight, water-resistant and less likely to wrinkle; having high tear strength; and being easy to walk on—even when wet. Theoretically, the main issue is the product can’t be left exposed to the elements for extended periods of time. Although synthetic roof tile underlayments and their purported attributes seem appealing especially in Hurricane areas, there are significant issues to consider before using them. To date, there are no applicable ASTM standards for these products. Many synthetic tile underlayments do not meet current building code requirements, so manufacturers need to obtain a contractor code evaluation report for local code compliance. As a general rule by a Arizona tile roofing contractor where the average temperature for January is 30º F or less, We suggest installation of an ice-dam protection membrane. An ice-dam protection membrane maximum roofing tile underlayment protection generally is a self-adhering polymer-modified bitumen membrane. Recommended by a statewide roofing contractor in low-slope applications to use ice dame protection for homes in the higher elevations of the Scottsdale area and statewide Arizona if your business is in a freeze zone. Triangle Roofing Company has been setting a higher standard as a metal roofing contractor, serving Arizona Statewide for commercial and residential in the Scottsdale area. A metal roofs in Arizona is a sound investment and adds beauty and value to any home or business. Lasting for a long time on your residential and commercial properties. With our intense heat in Scottsdale and sun in the upper elevations around Arizona statewide. We recommend a high-temp underlayment like Grace Ultra to get the maximum life of your system. They are backed with our equally long certified metal roofing contractors warranty. They are cost effective as they can be installed over some old systems to save on tear off costs incurred while bring it to the current standard. Metal systems provide a protective fixture that does not crack like roof tiles. They are highly durable and are able to withstand extreme weather conditions with very little storm damage from heavy snow, hurricane force winds, wind driven rains, hail and extreme heat. Our metal roofing systems are usually made of galvalume, steel, copper or aluminum. Custom formed into standing seam, shingles or panels the durability makes it an ideal roofing material. With the highest viability in the commercial sector. Manufacturers of metal systems reap huge profits, as the demand is high for these products. Our custom metals come in a variety of standards, shape, sizes, and colors are endless. Their attributes are impressive. They are long lasting and durable requiring little or no maintenance. Adding style and appeal to your property as they also offer extra protection through their fire resistant properties. Metal roof systems set the standard for energy efficient and have been known to reduce energy bills by up to 20%. Our metal systems are available in flat sheet, standing-seam, Bermuda panels and shingles. Our standing seam roofs are more common in the commercial roofing industry more now than ever before. On residential custom homes, these products provide the most durable system as you can get. The durability and quality of our roofs comes from quality installation and is enhanced by the gauge of the metal roof system. Our metal roof systems are generally less expensive compared to most other metal systems installed by a Phoenix roofing contractors, they are lighter in weight and are available in numerous appealing colors and designs. They retain their aesthetic appeal for a very long time. In addition, due their lightweight construction they exert very little strain on the structure. Their inherent rust resistance is also a big advantage. Available in countless shades of weathered copper, real copper, green, gray etc. these products complement the decor and architectural style of any building structure. Modern technology has imparted reflective and heat resistant qualities to metal products. Stainless steel is one of the costliest, but most durable roofing materials with claims of lasting for over half a century or even more. Excellent qualities of rust resistance and thermal reflectivity make it long lasting and energy efficient. Many types of stainless steels are coated with special alloys of zinc and tin, which enhance the properties of strength, durability, energy efficiency and high corrosion resistance even when exposed to extreme harsh and saline weather conditions. Copper standing seam is another good metal option generally used in high-end posh residential buildings. Fasteners used in copper roofing can only be of copper, stainless steel or brass. We are setting the standard as Phoenix roofing contractor with many successful copper roofing projects in Carefree, Cave Creek, Fountain Hills, Paradise Valley, Phoenix and Scottsdale. Being biodegradable and recyclable, metal roofing systems are highly eco friendly. Installation is relatively easy as sheet metal can be welded or soldered/fixed with fasteners, whereas factory made metal panels and shingles have easy four way interlocking arrangements for quick and secure installation. There are three general standards for metal systems used for steep-slope commercial roofing applications: architectural, structural metal panels and metal shingles. Generally, architectural metal panel systems are water shedding and are intended for use on steep slopes. Structural metal panel systems are used on low and steep slope. Structural metal panel roof systems can be used on low slope roofs because of their hydrostatic, or water barrier, characteristics. Because architectural metal panels typically are used on steep slopes that will shed water rapidly over the metal panels’ surface, the seams typically are not watertight. Many architectural metal roof systems are well suited for use on slopes of 3 inches per foot (14 degrees) or greater. One exception to the general slope guidelines for architectural metal panel systems is the traditional flat seamed, soldered or welded metal roof system, such as copper. It may be specified on slopes less than 3 inches per foot (14 degrees). Solid roof sheathing, or decking, is required for architectural metal panel roof systems, and recommends using underlayment a very quality underlayment. Checkout our latest Anthra Zinc Dome topping a Mansion here in Scottsdale. Sprayed Polyurethane Foam is applied as a liquid using plural-component spray equipment to fill cracks and crevices. It then expands approximately 30 times its original liquid volume to form a hard, closed cell monolithic surface. The foam dries within seconds after applied to the deck surface. Its expansion results in a weather tight membrane that is fully adhered to the substrate. Because its lightweight it adds little additional weight to the structure and is often used in remedial applications. This foam roofing contractor has a history of more than 20 years in Arizona. Our foam adds excellent insulation value to the structure and your utility bills can reflect the difference here in the metro Phoenix area. Once the foam has been applied by us as a foam roofing contractor to the proper thickness and finish specifications, a protective layer of coating or gravel is applied. This protective layer produces a durable weather resistant surface and that can be walked on for normal maintenance. Our foam adheres to just about everything so it can be installed over concrete, steel, and most existing metal roof systems which saves on the expense of tear-off and our Arizona landfills. Spray apply a tapered roof system with our foam which eliminates the need for costly tapered insulation systems. The cants and vertical wall terminations are also spray applied making them an integral part of the our system and minimizing additional component costs. When most people hear of a “foam roof”, they automatically think of the type of soft foam similar to that used for seat cushions and are concerned that they won’t be able to walk on it without causing problems or damaging the foam. Triangle Roofing Company’s foam systems are very durable and can handle foot and construction traffic as well as other roofs. They are still susceptible to damage from dropped tools just as any other roof but the damage is more easily seen and can most often be repaired with some simple polyurethane caulking. Triangle Roofing Company offers a free annual inspection with every five- twenty year systems. Density of foam is important when it comes to strength and Thermal Resistance. Obviously, higher density foam means increased strength and higher R-value. Most metro Phoenix area foam roofs have densities ranging from about 2.5 pounds per cubic foot to 3 pounds per cubic foot. Three pound density foam has a compressive strength of about 50 psi and an R-value of 7.14 installed and 6.86 aged (these numbers may vary slightly depending on the manufacturers mixture based on the EPA). Here’s an example of how well a good a foam roof insulates. A school district in Scottsdale, AZ had recently installed some new, one-room relocatable classroom buildings. During the late spring and early fall, these classrooms were using their air conditioners an average of 50 minutes every hour. The school district installed our foam roofs on some of these classrooms in order to see if it would provide an energy savings. The roofs consisted of three pound density foam, 1.5 inches thick with our roof coating system. The air conditioner usage was cut down to fifteen minutes every hour. That’s a fifty-eight percent savings on energy costs. Does this mean our foam roof will pay for itself? Absolutely! ASU studies indicate that foam roofs in Arizona and the Phoenix metro area climate with our commercial foam roofing system can pay for itself in approximately four and a half years. You need coating on your foam roof to get any lifespan and to properly maintained a foam roof, then your foam can last a very very long time in Arizona sometimes over 30 years. Every five, ten or fifteen years, depending on the type and amount of coating applied, the roof will need to be cleaned, primed, and recoated. If this is done, then could last 50 years or longer in the Phoenix metro area. As with all our other systems, cost depends on several factors. Some of which include building accessibility, complexity of project, foam thickness and roof coating system, plus the location. Once the foam has been applied to the proper thickness and finish specifications, a protective layer of elastomeric coating or gravel is applied. This protective layer produces a durable weather resistant surface and that can be walked on for normal maintenance. ENERGY STAR qualified roof coating products reduce the amount of air conditioning needed in buildings, and can reduce energy bills by up to 50%. The Cool Roof Program defines certain standards for reflectivity, and maintenance of reflectivity, in roof coating systems. These light colored roof coatings reflect the suns heat and UV rays and often lower the temperature of the roof by up to 100 degrees. These same standards apply to our coating systems on all roof types. Installation of involves different procedures based on the existing roof structure. It is important to be familiar with all Arizona and local Phoenix building codes to assure the appropriate materials and procedures meet the necessary requirements in your area. Custom Zinc and Copper Roofing Dome’s in copper and zinc turnkey roofing services. We can custom fabricate Zinc and Copper roof Domes and ship them turnkey. You just lift and install. First established in 1993, we guarantee a fast, friendly and efficient service and all our work is carried out to the highest standard. Copper and zinc roofing has been around for hundreds of years, and still has no rivals to its longevity. Coupling durability with traditional elegance, these roofs utilize tried and tested methods, and will add value and quality to your home. Our craftsmanship fabricator’s have been trained in traditional installation methods, and work to the highest standards to achieve a roof that is as visually appealing as it is watertight. Both copper and zinc can be used to provide a solution to any feature that would be difficult using slates. For example, towers, domes and spires often use zinc or copper, and are able to withstand the rigors of the weather in their exposed positions. Custom folded metal roofing can last for 100 years or longer, with the added benefit of little or no maintenance. Although the cost of copper Barrel roofs may be slightly higher initially, its long lasting and low-maintenance characteristics mean it typically works out much less expensive over its lifetime than the so called “inexpensive roofing materials”.